JC Motorhomes offer the best value in luxurious and quality American Motorhomes & 5th Wheel RV rental in the UK and Europe. We have Winnabago-type motorhomes based in both UK and Europe which enables us to supply them to you at highly competitive prices. We can deliver to all the racing circuits in Europe as well as any other event or location. Our motorhomes are used at Le Mans 24-Hours and classic events, BTCC, BritCar to name but a few. Joining our fleet is an RV specially adapted for disabled access, click here to find out more..
1st Containers provide secure new and used shipping containers, along with storage containers of any size, type and quantity. We currently provide containers for sale, hire and conversion throughout the UK. 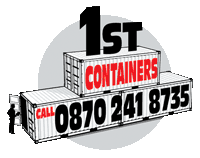 Buy or Rent Containers With a wide range of new and used containers in stock, our 1st Containers team are able to cater for any requirement that you / your business has from purchasing to hiring our products on short or long term basis. Spacewise Storage Containers and Event specialists. At Spacewise we offer specialised equipment for events including refrigerated containers, portable chillers, toilet blocks, cabin and dry storage containers including generators. We offer very competitive rates for any type of event and for any length of time; from one day concerts to events which go on for several weeks or months. © smarts4you racing 2010. All rights reserved. Web site by ByTheScruff.